What is Open Cell Foam and how does it work? Here at Fusion, we're not chemists but the chemists who make the two component formulas that make up our foam tell us that when "open cell foam" is heated and pumped through our truck mounted chemical reactors, the resulting foam cells expand rapidly, and very quickly, up to 150 times their original liquid volume. This rapid and massive expansion causes the formation of a soft flexible foam cell structure, a bit like a choclate aero bar. It doesn't stop there. The expanding gasses rupture most of the cell walls in the newly formed foam , and so we term this type of foam "Open Cell" i.e. the cells are 'permeable' so they can actually 'breathe' . In other words unlike closed cell foam there is no gas trapped in the tiny cells of the solid foam, its just air and it can move gradually in and out of the cells. Why is this good idea? Well it's a good idea for a few reaons. Firstly becasue the foam has a cell structure which contains partially trapped air, the thermal performance of the foam is very good . Becasue of the 'open cell structure' the foam can 'breathe' . What this means in practice is that the foam is open to water vapour diffusion . Another great advantage of open cell foam is that it's very economically priced per m2 . So the insulation system that you thought you couldnt afford is in fact very affordable. OPEN CELL AGREMENT CERTIFIED FOAM has another great party trick. It's a brilliant acoustic insulator. Customers of ours are amazed at how differently their houses 'sound' once we insulate their attic. One woman told us that she was amazed that she couldn't hear the rain beating on her roof anymore. Open cell would also be a wonderful insulator to put between, say a ground floor and a first floor especially if the intention was to reduce footfall noise being transmitted from upstairs, to downstairs. How is it applied? OPEN CELL AGREMENT CERTIFIED FOAM is a two component formula applied under pressure and using high temperatures. It's sprayed on initially as a liquid, which then rapidly expands into a semi-rigid mass, automatically sealing off drafty areas such as baseboards, headers, sill plates, around windows, doors, electrical outlets, pipes, etc. It also minimizes uncontrolled air leakage throughout the building envelope (wall, ceilings, etc. ), thereby reducing energy losses and the possibility of mold, mildew and premature decay. Open-cell (semi-rigid) spray foam insulation remains flexible throughout the life of the building. As the building expands and contracts with changes of season and temperature, it will move with the changes without destroying the seal. OPEN CELL AGREMENT CERTIFIED FOAM comes with a lifetime performance warranty. As well as simplifying the construction process for the builder, open-cell spray foam insulation eliminates the major causes of building envelope problems - airborne moisture movement and entrapment. Heating and cooling costs are typically reduced by 30 to 50%, and more money can be saved by purchasing a (properly sized) smaller, less expensive heating and cooling units . At what stage of construction is open cell foam installed? In new construction, OPEN CELL AGREMENT CERTIFIED FOAM is installed after the windows, doors and roof are installed, the electrical and plumbing inspections are completed, and after any other electrical or mechanical system. It is the last installation to take place before drywall is installed. Can OPEN CELL AGREMENT CERTIFIEDFOAM be applied in an existing structure? 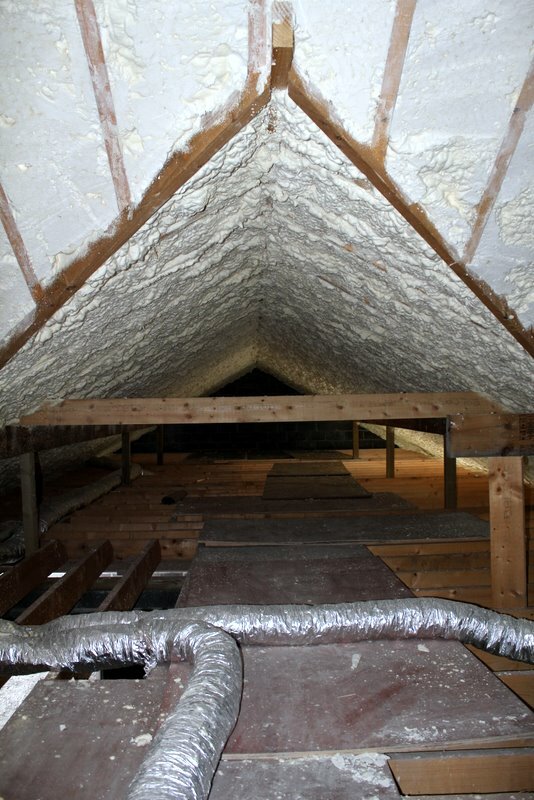 Excellent results are achieved in using OPEN CELL AGREMENT CERTIFIED FOAM in the attic and in the crawl space (if applicable) without disturbing the walls in a retrofit application. The reason is that a large portion of a building’s energy loss is caused by the "chimney effect" - hot air rising therefore creating air movement within a building. For existing walls, a "pour-in-place" formula of our foam insulation is preferred. Spray foam insulation is used in walls where drywall has yet to be installed.